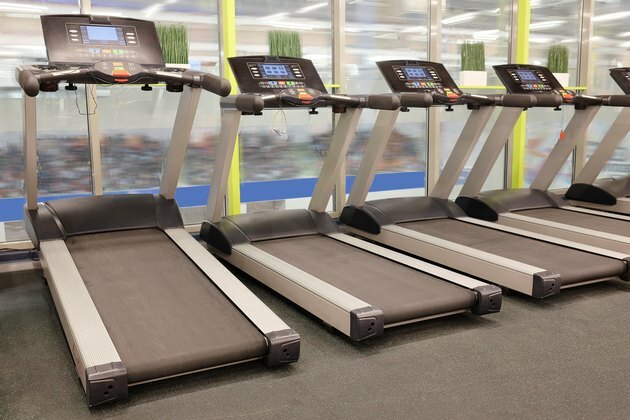 NordicTrack is known for making a wide variety of exercise equipment, including treadmills for home use. NordiTrack treadmills are loaded with modern features and designed for ease. They also feature folding platforms that make it easy to move them from room to room. If your treadmill is folded up in storage mode, dropping the platform is as simple as releasing the safety latch and lowering the deck to the floor. Position the treadmill so that you are facing the underside of the walking platform. Grab the handrail firmly at the top with one hand. Locate the latch knob. On some models, it is on the left-hand side and on other models, it is located in the middle of the walking platform. Pull the latch to the left to release it from the locked position. It may be necessary to pivot the frame downward in order to release the latch. Hold the walking deck with both hands once the latch is unlocked, then slowly lower the platform to the floor. Place a mat or rug underneath the treadmill to prevent damage to your floor. Change the incline to the lowest level before returning the treadmill to storage position.